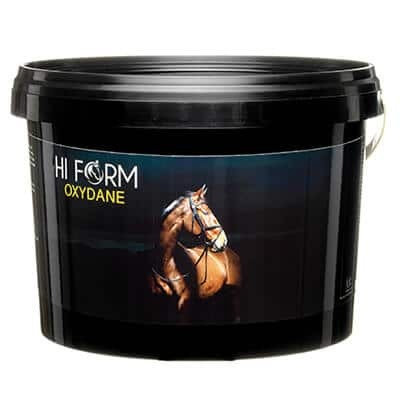 The team from Hi Form recommended that we used Oxydane to help cope with his nervous behaviour,………………I have used many other calming products on horses, so I was instantly curious to try out this product which many other riders were so confident about. Instantly, I could see why so many people truly believed in this product. Within a very short period of time, Colin’s focus and attention in the ring had improved, helping him to relax and perform to his capabilities. He’s also calmer in the stable, and has lost any nervousness seen before. I would highly recommend Hi Form Oxydane to anybody, both professional and amateur. I still can’t quite believe the changes I have seen in Rudy since he has been on Hi Form, and not just me either. Rudy can be a bit of a challenge and apart from me; only one other person at the yard would handle him. Now, he is so chilled and quite soppy at times and will give anyone kisses even if they haven’t got a carrot LOL and now anyone will put him out or bring him in. He could be quite spooky, anything new around the school or field and he would create merry hell. Also out hacking he could be spooky and not want to go past things or end up going sideways down the road. We don’t have any of that anymore since he’s been on Oxydane, he is an angel, so relaxed and happy. 4 months on from using Hi Form Oxydane, I’ve just clipped them and they are absolutely glowing with good shiny coats and skin. The best they have ever looked. Just ordered some more. Included in Oxydane is Equisoy – Don’t confuse or relate this to by-products like soybean meal used in most horse feeds. Not only is it an amazing product, it is also oral grade (human quality and is used in health foods). This is full fat debittered soy flour, a palatable source of protein, and is NOT an animal feed and it is certainly NOT a filler. Vitamin A E672 713568 I.U. Vitamin D3 E671 204562 I.U. Vitamin E 3a700 45592 I.U. A 5Kg tub of Oxydane (£320) with a horse in medium work, fed at 15 g per day will last approximately 333 days = 0.97 per day or a horse in heavy work, fed at 20g per day will last approximately 250 days = £1.28 per day. Mix thoroughly in the daily feed for superior nutritional balance and exercise recovery for ALL horses & ponies.